264 pages | 3 B/W Illus. In the World Library of Educationalists series, international scholars themselves compile career-long collections of what they judge to be their finest pieces—extracts from books, key articles, salient research findings, major theoretical and/or practical contributions—so the world can read them in a single manageable volume. Readers thus are able to follow the themes and strands of their work and see their contribution to the development of a field, as well as the development of the field itself. Contributors to the series include: Michael Apple, James A. Banks, Joel Spring, William F. Pinar, Stephen J. Ball, Elliot Eisner, Howard Gardner, John Gilbert, Ivor F. Goodson, and Peter Jarvis. 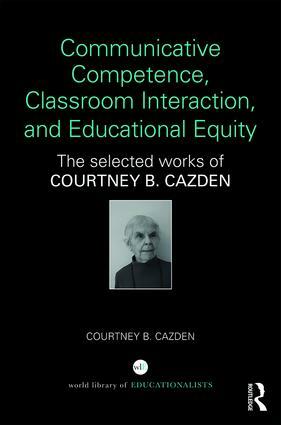 In this volume, Courtney B. Cazden, renowned educational sociolinguist, brings together a selection of her seminal work, organized around three themes: development of individual communicative competence in both oral and written language and discourse; classroom interaction in learning and teaching; and social justice/educational equity issues in wider contexts beyond the classroom. Since the 1970s, Cazden has been a key figure in the ethnography of schooling, focusing on children’s linguistic development (both oral and written) and the functions of language in formal education, primarily but not exclusively in the United States. Combining her experiences as a former primary schoolteacher with the insight and methodological rigor of a trained ethnographer and linguist, Cazden helped to establish ethnography and discourse analysis as central methodologies for analyzing classroom interaction. This capstone volume highlights her major contributions to the field. 5 Analyses and interpretations: Are they complementary? 7 Peer dialogues across the curriculum. Proceedings from the 1979-1980 Impact Conferences sponsored by IRA and NCTE. Courtney B. Cazden is the Charles William Eliot Professor of Education, Emerita, Harvard Graduate School of Education, USA. She is a member of the National Academy of Education, a recipient of a Fulbright research fellowship to study minority education in New Zealand, and a past president of the Council on Anthropology and Education and of the American Association for Applied Linguistics.